Prepare for race action with the Ultimate Florida Speedway! At an epic 5-feet long from end to end, this Cars 3playset is loaded with exciting movie-inspired details like themed play areas. 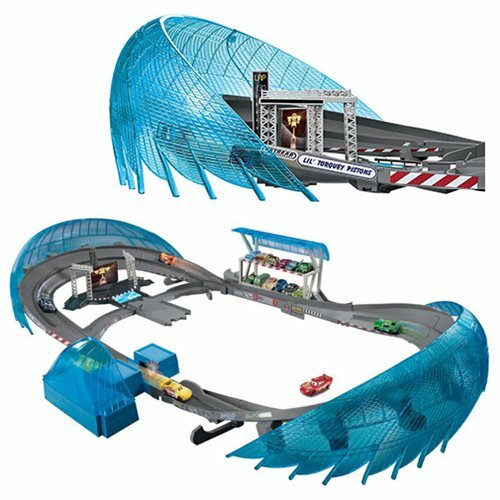 This ultimate racetrack features a motorized booster, a raised track for increased velocity, and two key competitor cars: Lightning McQueen and Jackson Storm. The booster propels the vehicles around the track at thrilling speed. As each champ tries to gain the racing edge, use the diverter so they switch lanes. Other characters (sold separately) can cheer from the stands as their favorite racers brave hairpin turns at high velocity. The Ultimate Florida Speedway also connects to the Florida Speedway and the Spiral Garage sets to keep the Cars 3 action going and going (sold separately)!